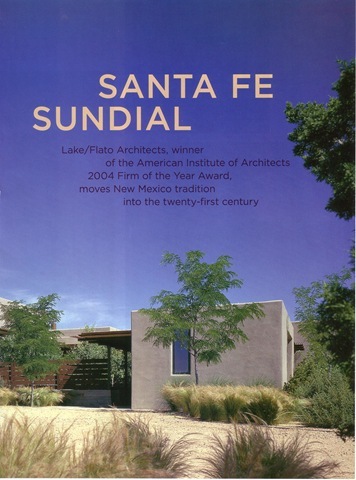 Lake/Flato Architects, Winner of the American Institute of Architects 2004 Firm of the Year Award, moves New Mexico tradition into the twenty-first century. THIS YEAR’S AMERICAN INSTITUTE OF ARCHITECTS (AlA) ARCHITECTURE FIRM AWARD, PRESENTED TO SAN ANTONIO-BASED LAKE/FLATO ARCHITECTS, shows just how far a firm can go by remaining faithful to a particular sense of place. The honor, the highest the AlA can give a firm, validated Lake/Flato’s reputation for environm ental awareness, sensitivity to site and, above all, fidelity to its Texas roots. Fusing the practicality of nineteenth-century Texas vernacular with modern form and function, Lake/Flato has created a generation of buildings as carefully fitted to the Texas climate and landscape as a pair of custom cowboy boots. Client Sarah Dunning never doubted that Flato and his associate, Andrew Herdeg, could make it in New Mexico. Her concern was establishing her own sense of style in a region where the local vernacular has achieved near ubiquity. It was never my thought to do a Santa Fe house, says Dunning, an accomplished Dallas-based interior designer who had recently collaborated with Flato on a major renovation of a Dallas prep school. “At the same time I didn’t want to do something so totally out of character that the neighbors would be up in arms. So the charge was to create a more contemporary environment, because that’s what I love, but to make it work in Santa Fe. The elements of that sundial are actually six separate stucco-surfaced units—four bedrooms, a large living-and-dining room, and a garage and kitchen—arranged around an interior courtyard and connected to one another by a network of glassed-in and open porches. The siting of the rooms was crucial, says Herdeg. “There’s a scattering of other houses around, and the trick was to position the porches and the building blocks to edit out those other houses so that you didn t feel you were sharing someone else s view. 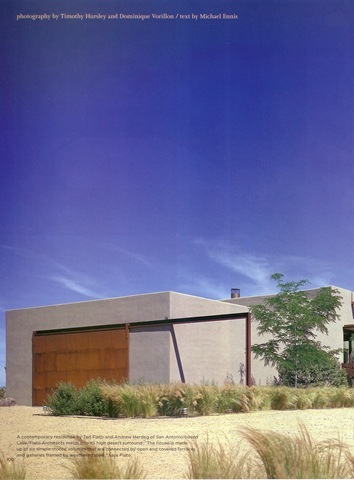 The architects also adroitly exploited the “green” characteristics of the thick adobelike walls, using them as sunshades around deeply recessed windows that allowed a series of signature views from within the rooms while keeping the piercing desert sun out. “Those wonderful thick walls, clad in plaster, are great for absorbing the cool air you have here at night even during the summer,” says Flato. “This is a house for the most part designed without any air-conditioning.” With a fully operable system of screens and windows, the house can be flushed with cool air on summer evenings. A radiant-heat floor system stands up to the frigid winters. 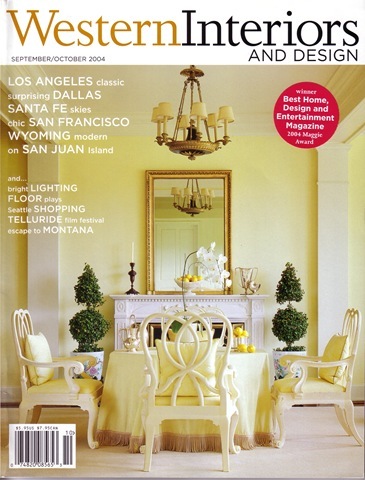 As both interior designer and her own client, Dunning not only resisted the house-as-ethnographic-museum impulse endemic to Santa Fe but stayed away from southwestern chromatic clichés. “The palette of this house is very quiet,” she says. The colors meld into each other. Untinted poured-concrete floors flow into grey French limestone porch pavement and smoothly finished, integrally colored greyish beige plaster walls. The spare furnishings are classic modern, ranging from 1930s sofas to a stainless-steel table designed by British architectural luminary Norman Foster. The kitchen is as sensuously bare as a Donald Judd installation, with a box- shaped poured-concrete island framed by ebony-stained walnut cabinetry.